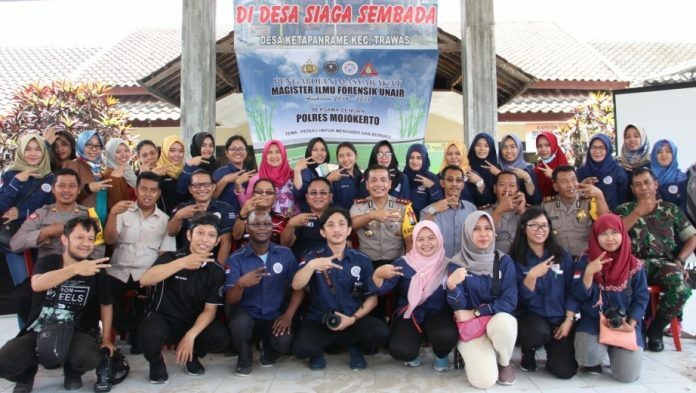 UNAIR NEWS – Forensic Science Master’s (S2) Program, Postgraduate School of Universitas Airlangga, as the only Forensic Science Study Program in Indonesia, recognizes the importance of Forensics in society. The public’s understanding is still lacking. The event encouraged the UNAIR Postgraduate School to hold community service to educate people on forensics on Saturday, April 7. The community service located in Ketapanrame Village, Trawas Subdistrict, Mojokerto Regency was themed Care to Serve and Share. “Ketapanrame village was chosen due to its people who do not know about forensics, on handling a case. So this village is considered appropriate, “said Moc. Kurniadi Hendry Ekodiyanto, as the chief executive of the activity. On that occasion, the public got the education from Prof. Dr. Med. HM Soekry Erfan Kusuma, dr.SpF (K)., DFM on forensics, Pudji Hardijanto, SH regarding the case, and in cooperation with Mojokerto Police which conveyed the values ​​of nationalism. The dissemination educated the people and the officials of the village to be careful of hoax news and insights when bodies are discovered. On handling the bodies, people are advised not to touch, hold, and move. “After the dissemination, the public understand not to touch, hold or remove items at the scene because it will reduce the discovery of evidence to find the perpetrators,” added Hendry. After the dissemination, there was a planting event for 150 stems of bamboo. Hendry said the community was pleased and highly appreciated by the sub-district and village officials because bamboo is needed for irrigation in the village. Not only that, local youth were actively involved in the event. ” In the future, the planted bamboos will be monitored so it can be assisted village. We are also encouraged to do it in other villages because the public society is still taboo for forensics, “explained Hendry. Hendry hoped that with the community service, they were able to give an understanding on the importance of forensics because various cases in Indonesia still uses forensic experts from abroad. When the other countries are able, Indonesia through UNAIR Forensic Science S2 can definitely be the front guard. The same thing was conveyed by Vice Director I of Postgraduate School Prof. Dr. Anwar Ma’ruf, drh., M. Kes. According to him, forensic science is potential and appropriate to UNAIR strategic plan so the institution needs to make Forensic Science popular.